Shoulder pain is a common presentation that chiropractors treat and is one that requires an in depth understanding of anatomy, referral presentations, compensation movement patterns and the latest best practice applications to restore function and reduce pain. 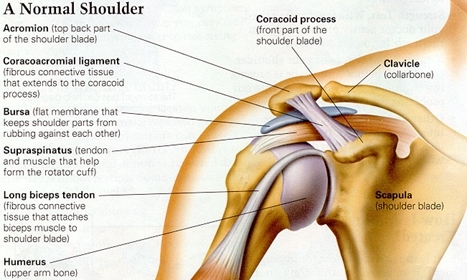 The shoulder girdle is a complex region as is compromises four joints. Dysfunctional movement or lack of movement in one of these joints will affect all joints, resulting in shoulder pain, shoulder muscle tendinopathies, bursitis, muscular tears or instability. At Total Body Chiropractic will diagnose your tissue in lesion and assess the movement of all the joints in the shoulder, allowing specific chiropractic and muscle treatment techniques to be applied, combined with prescription of specific exercises to target the dysfunctional joints. Pain in the hip can come directly from the hip joint itself or it may be experienced in the hip joint as a referred pain from a problem somewhere else. Referred pain is pain that travels along a nerve that comes from the back. The referred sensation of pain is felt in an area where the nerve travels or ends, but not necessarily from the point of the back where the nerve is being pinched. On the other hand, pain that comes directly from the hip joint can be from inflammation due to injury (Sprains, strains, and fractures), arthritis, infection, etc. One example of referred hip pain is a pinched nerve at the level between the fourth and fifth lumbar vertebrae. Pinching of this nerve commonly causes referred pain into the hip. True hip pain (pain from the hip joint itself) can be caused from an acute (usually accident related) or a chronic (usually arthritis related) condition. The treatment goal for an acute hip injury is first to control and reduce the swelling. After the swelling is controlled, the next phase is to help restore the mobility and return the proper function of the hip joint and leg. 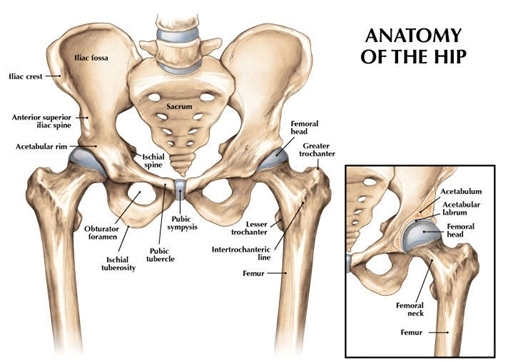 The goal of treatment of a chronic hip condition is to try and determine what caused the hip joint to become symptomatic, relieve or eliminate that cause, and rehabilitate the hip joint. At Total Body Chiropractic we are trained to determine if your hip pain is coming from a pinched nerve in your spine or directly from the hip joint, itself. 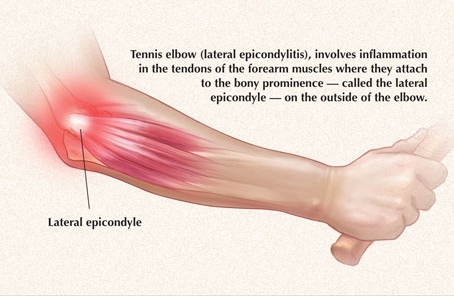 Elbow pain and disability in the elbow is more likely to be a tendinopathy (golfer’s elbow, tennis’ elbow) or a muscular strain and is often intricately linked to overuse at the wrist joint or poor mechanics at the shoulder joint. At Total Body Chiropractic we assess and treat all joints to ensure proper movement and function above and below the elbow. Chiropractic modalities work on all types of joints to enhance movement and joint awareness; coupled with muscle release techniques to reduce muscular tension and tendon irritation, the chiropractic approach can be beneficial to painful elbow conditions.